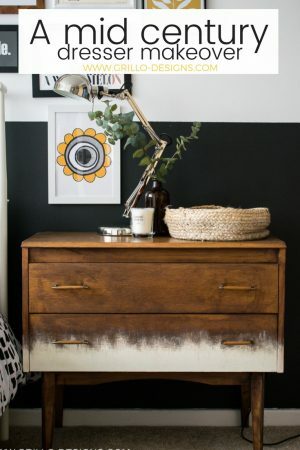 How To Paint Melamine Wood – and live to tell the tale! 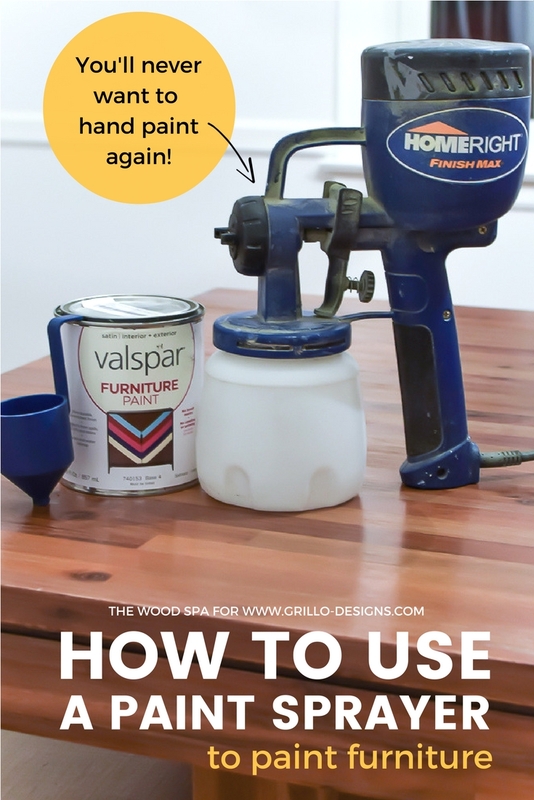 Learn how to paint melamine wood – and turn any outdated piece of furniture from drab to fab! 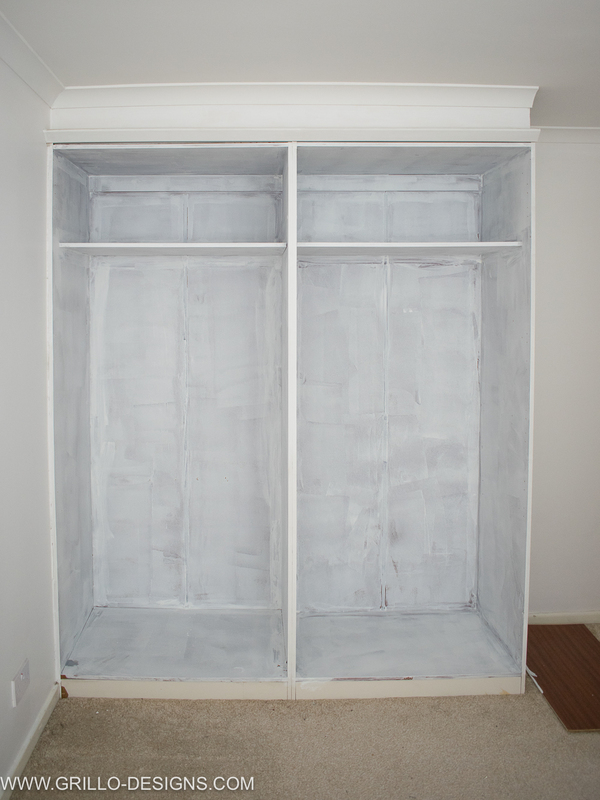 Believe me when I say, I never intended for the story of ‘how I painted and wallpapered my extra large melamine wardrobe’ to ever hit the light of day, let alone this blog (hence the lack of progress pics). You know…just move on with life. First on the agenda…. 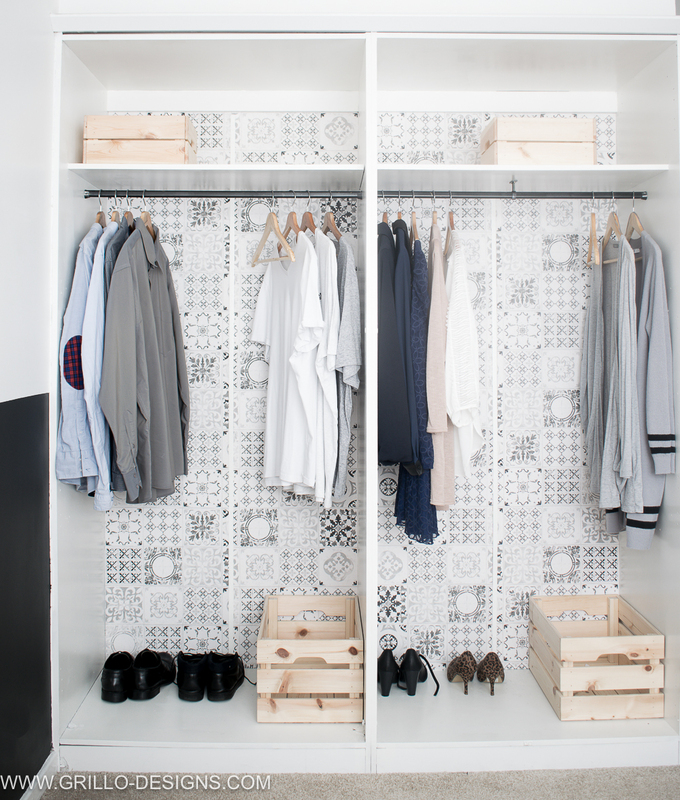 find a way to update the look of this beast of a wardrobe. And oh what a beast it was! It had been built in by the previous tenants (god, what were they thinking??). 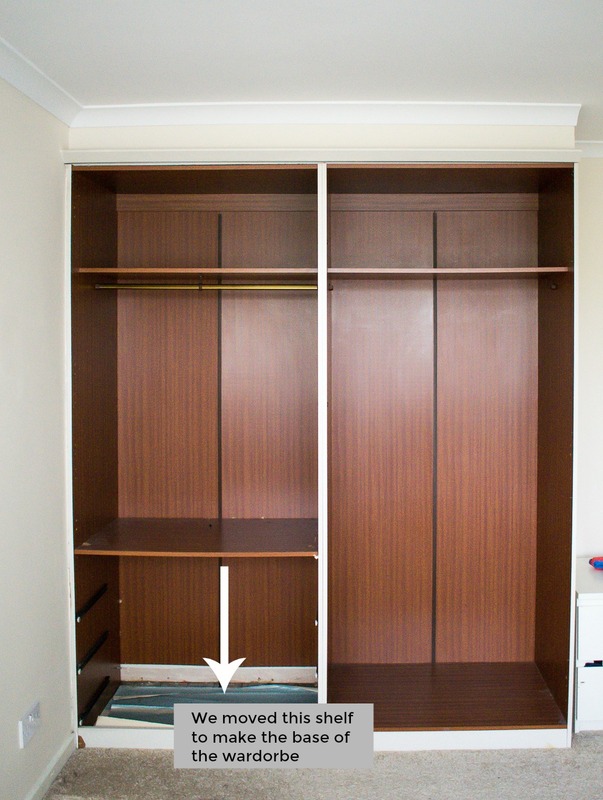 Upon moving in, we had removed its even uglier outdated doors, leaving the very unattractive melamine wood exposed for all to see. To put it bluntly, I hated it. The very sight of of the reddish fake grain burned my eyes. What choice did I have? I had to paint it. 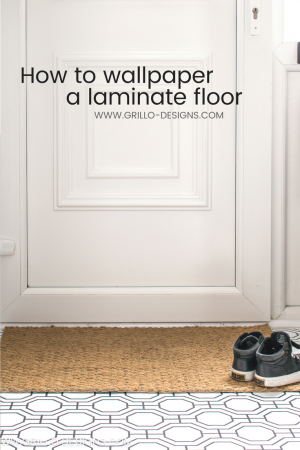 Wallpaper – this one I bought off ebay Uk! 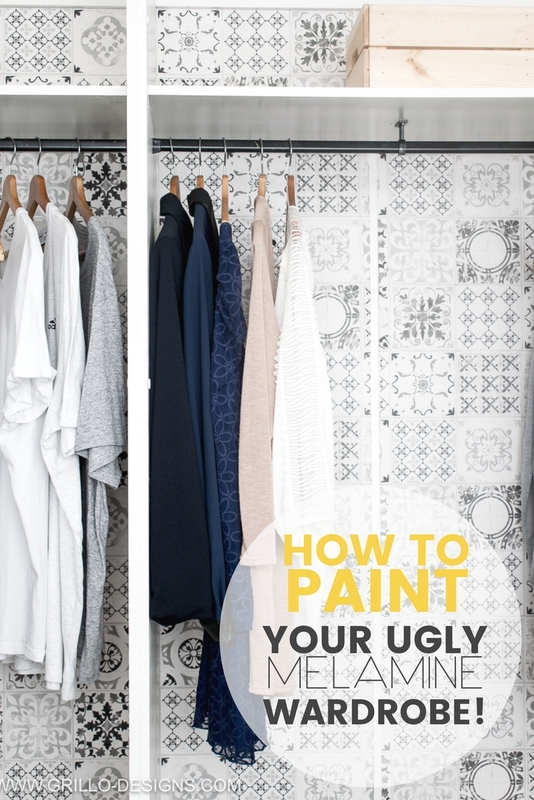 Last year I wrote a post about how to paint IKEA furniture – and the same rules apply when painting melamine. Melamine is similar to laminate in that it has no natural wood grain, making it hard to sand back, and even harder to get paint to stick! Don’t despair though, it can be done. It just takes a little more time. I used my palm sander to sand the inside of the wardrobe. 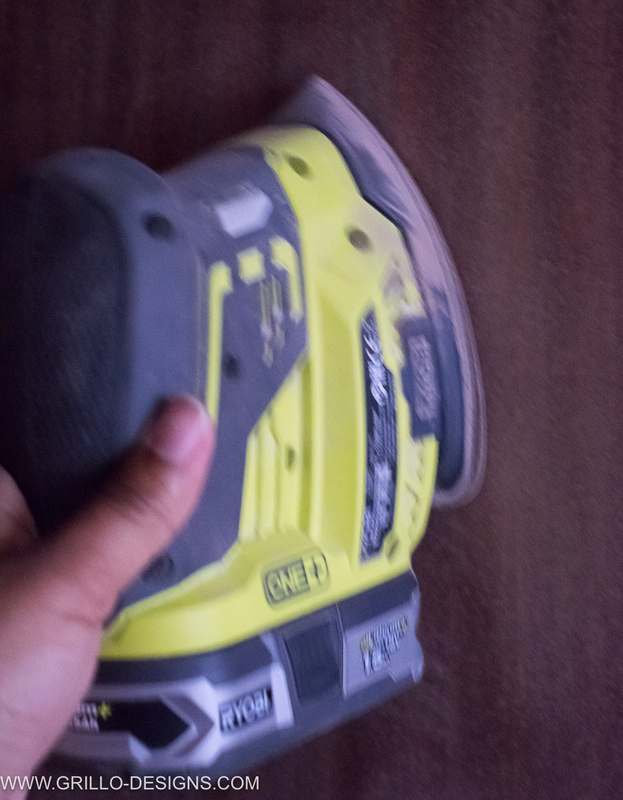 I also used 150 grit sandpaper for some areas like the edges, bottoms and detailing to ensure I got into all the nooks and crannies. Alternatively you can use a DE-GLOSSER to dull the shiny surface rather than sanding , but this is quite a strong chemical and needs to be applied in a well ventilated area. 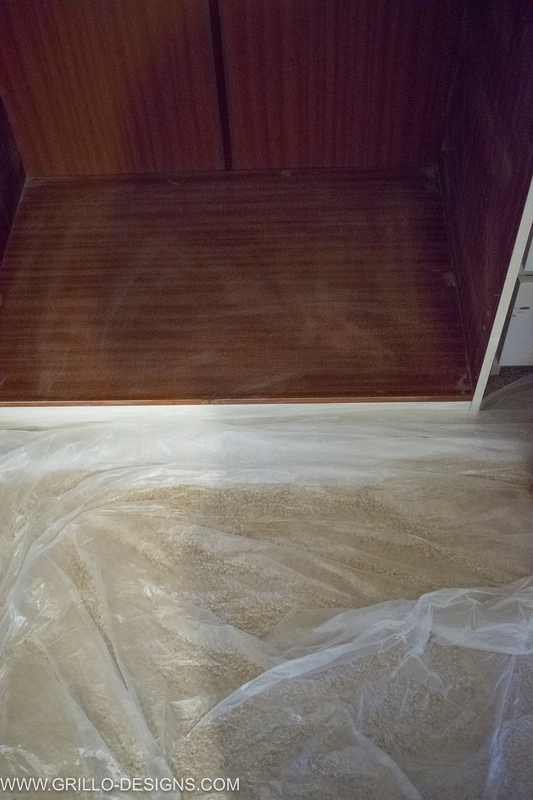 I used an old rag to remove all the sanding dust , then TSP diluted in water for a more thorough clean. 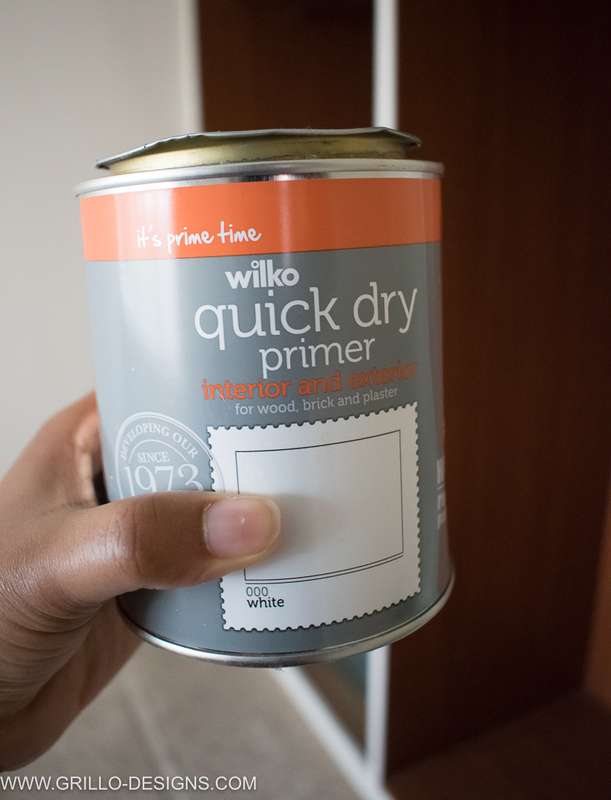 The Wilko brand primer I used is actually targeted for melamine and laminate type wood. Consequently it was quite thick and bonded really well to the wood . I initially applied the primer with a paint brush to all the edges and corners I knew the roller wouldn’t reach. Everything else was painted with the roller . I’m not gonna lie, watching the paint dry was the hardest part for me (impatience is my middle name). That and the multiple layers of primer I had to apply due to the sheer size and type of wood I was prepping. As always, I took to facebook to moan all about it! Once the primer had dried, I plastered on the final coat of paint. 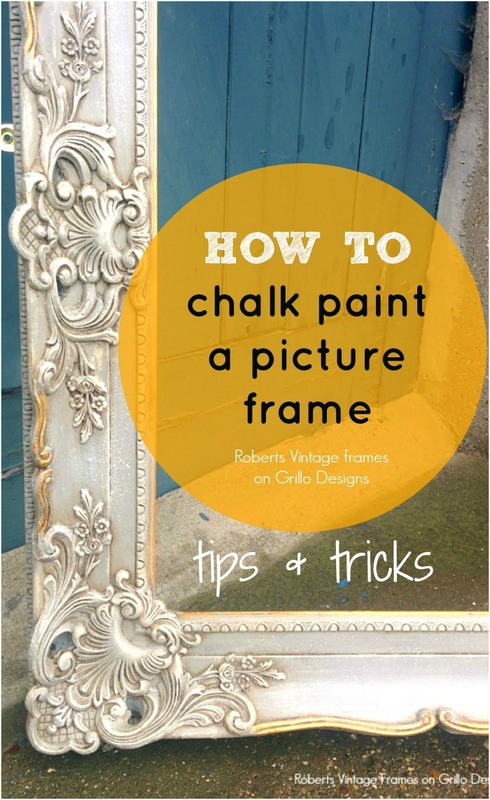 I chose to use Wilko furniture white paint but again you can use any brand, type or colour for your final coat. It really depends on the type of look you are going for. This is the wallpaper I chose..isn’t it gorgeous?? (you can also buy it from the US here) I used PVA glue and a foam bush to apply it to the back of the wardrobe. This was the final step! 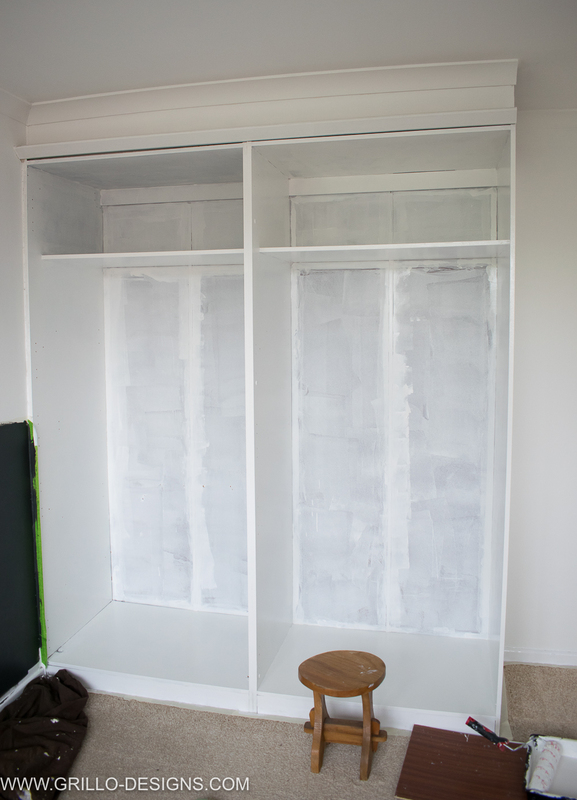 I used clear Ronseal varnish to seal the wardrobe (US version here) . 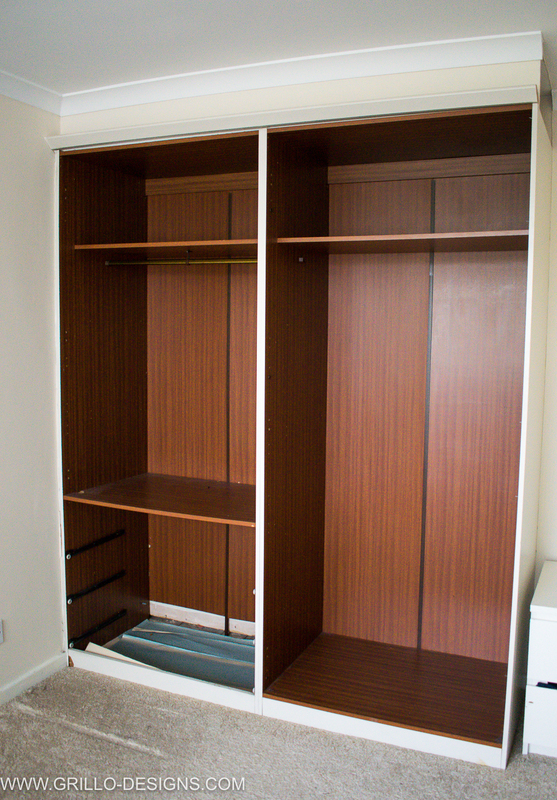 Transforming this melamine wardrobe took about two days to complete, but bear in mind, I spent a good portion of that time feeling a little sorry for myself at what seemed like an almost impossible task. Turns out it was more possible than I thought, but would I do it again? The open closet concept was only meant to be a temporary idea while I figured out what to do in terms of wardrobe doors. 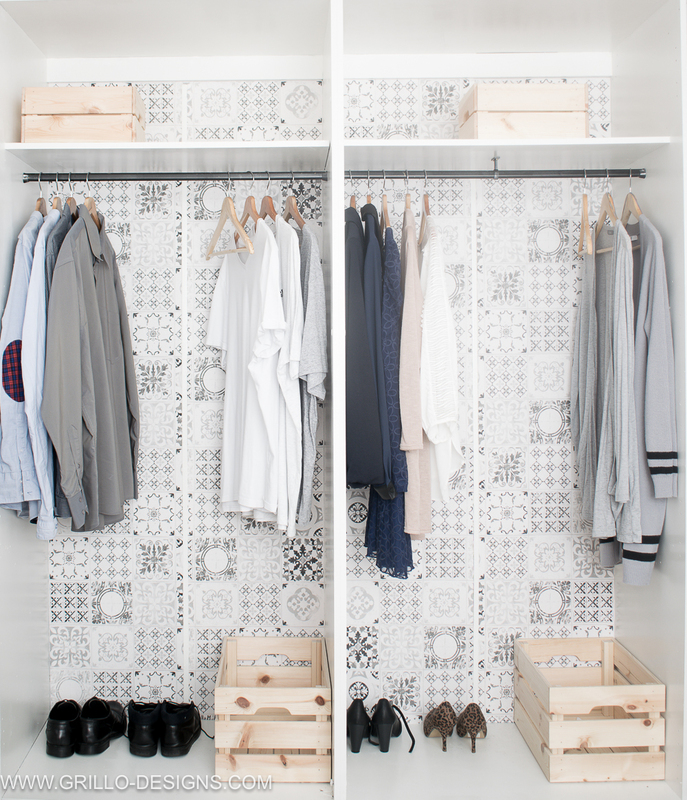 Clearly the open closet concept isn’t working for me..
UPDATE: CHECK OUT MY NEW WARDROBE DOORS HERE! 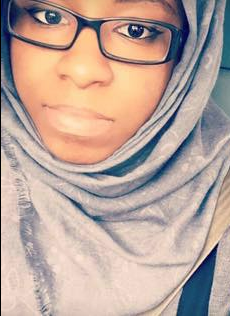 We’ve got quite a few other on this blog.. check them out below! 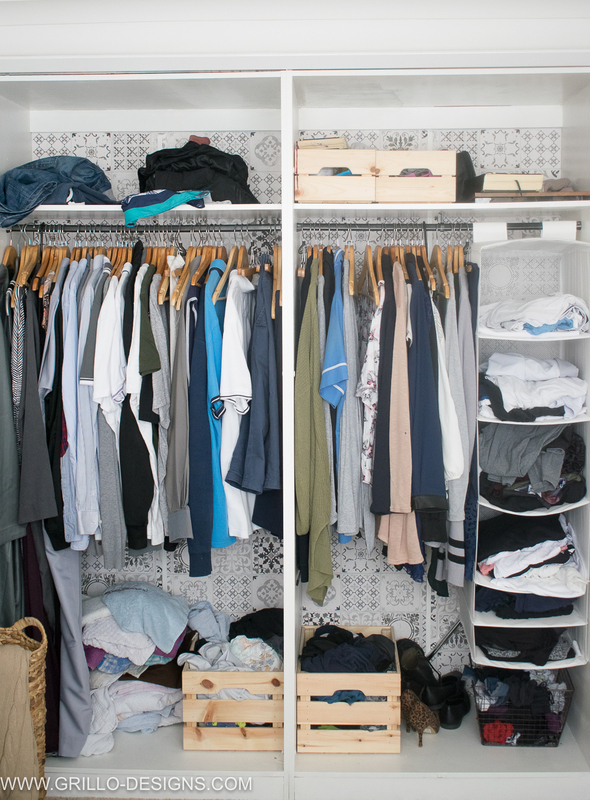 Thanks for sharing the ‘real life’ picture of your closet. 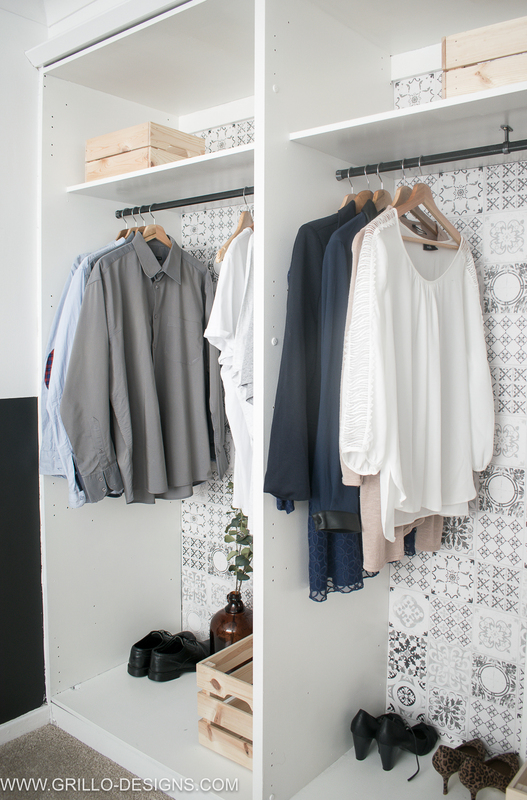 My husband and I would never be able to have an open closet. (Imagine yours, times fifty 🙂 ) The closet itself looks amazing though. Soooo much better than the original. I recently took the doors off of my closet. I had an idea, but when I started, it didn’t have the look I wanted. I planned on hanging beads. Well they were very sparse and you could see everything. Not the look I was going for. I ended up using a tention rod on the inside and hung up some black shear curtains that have glitter on it. Now I’m having issues with hanging the beads. One is too small and two are too big. I tried a tention rod for that as well but the beans are too heavy. My next move is to drill small holes on the inside of the door frame and put hooks us. I’ll send you a picture of my finished project when it’s complete. which I hope is soon. Anyway, thank you for you post and awesome ideas. Looks really good. 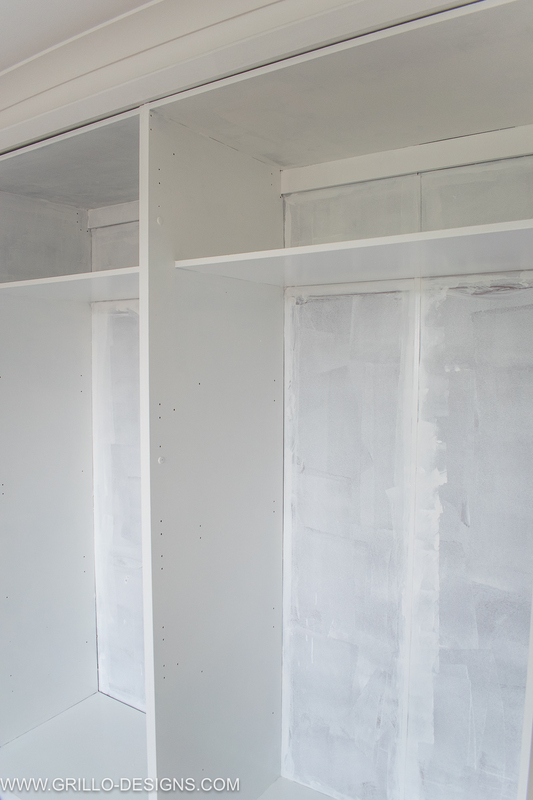 I’m in the process of painting our fitted wardrobes using the same primer and furniture paint. Did the varnish make a significant difference to the end result? Would you say it is worth the extra effort of applying it? 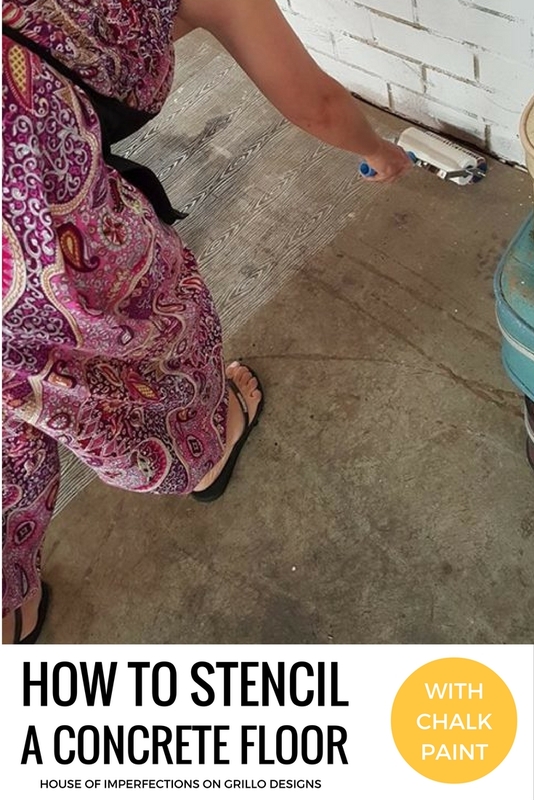 Yes I would def recommend it, the varnish just helps to protect the wood from any scrapes or bumps that might cause the paint to come off. And thank you! What a fantastic idea, I love the look and you wouldn’t know it was the same wardrobe! That is fabulous! Well done. I LOVE this Medina! I would never think to sand down melamine! But now I may need to try. 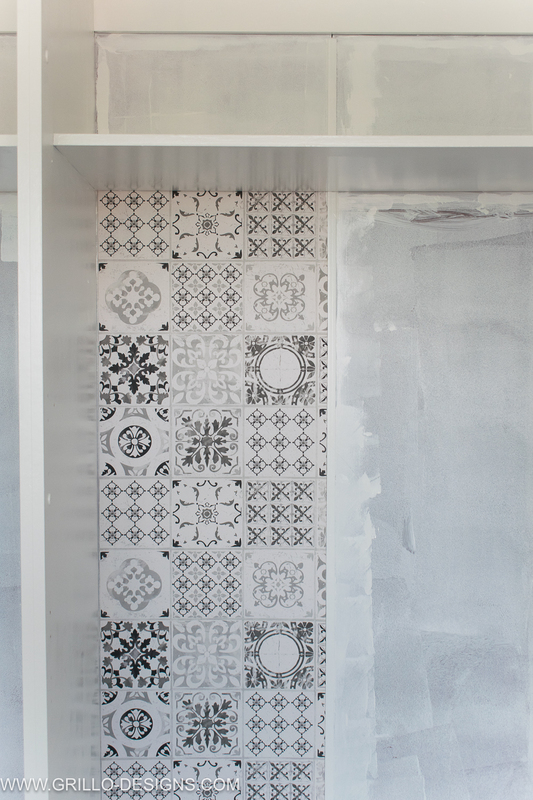 Love the wallpaper too – I thought you had painted the stencils! Amazing make over. I love the wallpaper you chose. I love that wallpaper you chose And its so much better white. It looks lovely! I painted our laminate desk and used primer and acrylic and it’s holding up nicely over two years later. Medina what a gorgeous piece! But you’re right! 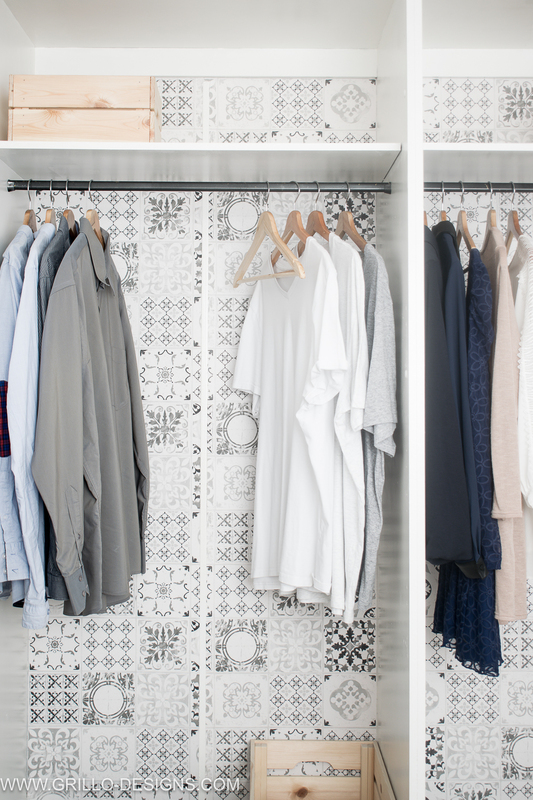 It’s probably not super practical to have an open wardrobe . I absolutely love the wallpaper. Wow, what a transformation. Loving that Morrocan tiled wallpaper. 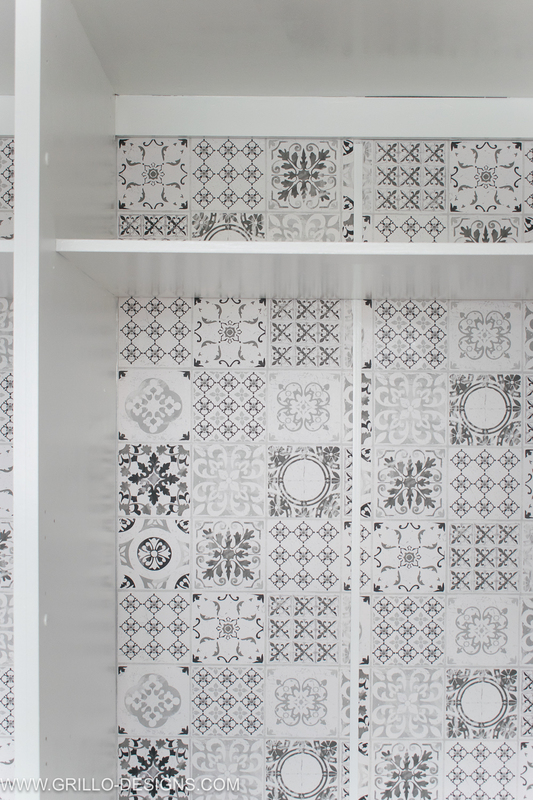 I’ve got a thing about Morrocan tiles, I’ve been stenciling them but didn’t know there was a wallpaper. Thanks claire.. me too! Im gonna do my stairs next!